We're repairing the flood damage to our rivers and drains to protect people, property and livelihoods. Two extreme weather events in early April 2017 brought prolonged torrential rain to the Bay of Plenty. The resulting record high river levels and extensive flooding caused significant damage to river and drainage networks and assets across the region, from the Kaituna River in the west through to the Waioeka and Otara Rivers in the east. A total of 520 sites have been identified in the repair programme with a repair estimate in excess of $45 million. The majority of damage is in the Eastern Bay of Plenty with over half the work associated with the Rangitāiki-Tarawera Rivers Scheme. Each damaged site has been prioritised based on the risk of the damage becoming worse, the consequence of that occurring, any impact to community assets, and the practical ability to complete the work required. High priority works are programmed to be completed by December 2019. The entire repair project is expected to take four years, with completion programmed for 30 June 2021. Work on 59 sites has been completed over the summer months. 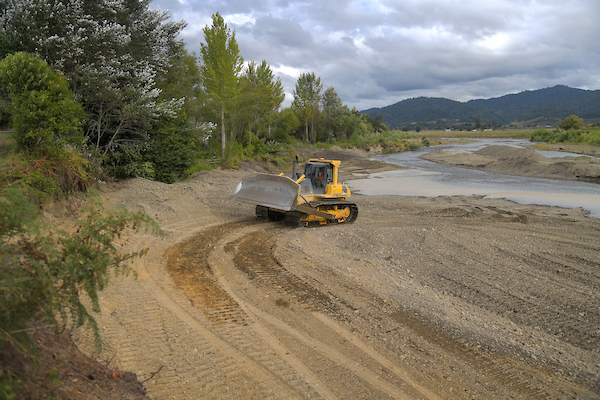 All sites in the Waiōtahe river scheme are now complete. Check out the Flood Repair Poster for additional information and progress tracking to 31 March 2019. Work is underway on a flood-damaged section of Lowe Road near Waimana, as part of a joint Bay of Plenty Regional Council and Whakatāne District Council project to provide safer road access for local residents. 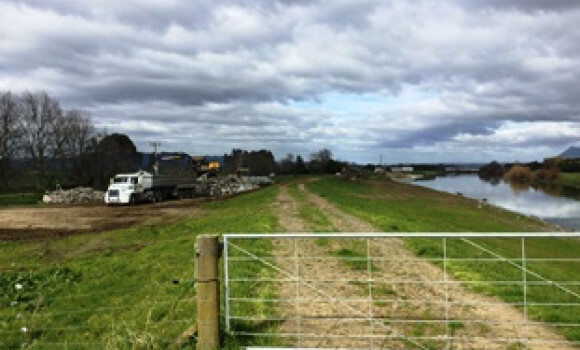 Bay of Plenty Regional Council Flood Recovery Project Manager Paula Chapman said the section had been badly eroded in the April 2017 flood event and scoured away to such an extent that the road surface itself was impacted. 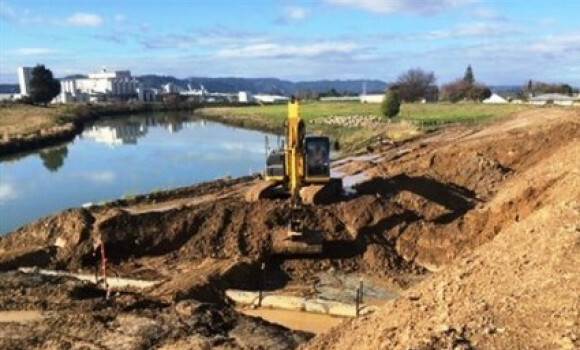 “The Tauranga River runs alongside Lowe Road in several places and during the April 2017 flood event, it eroded the banks, putting the road at risk in several places. This is one of our high priority repair sites and part of the $11.47m budget we have set aside for the 2018/19 year,” Ms Chapman said. Whakatāne District Council Transportation Manager Martin Taylor said the rural road was an important link between Waimana and communities up the Matahī Valley and was used daily by the school bus and local traffic. “Since the April 2017 flood, sections of the road have had to be narrowed with cones and orange mesh fences where the road shoulder has been completely eroded away. The next flood could easily be the one that then takes the road itself away. To ensure that doesn’t happen we are working together with the Regional Council to reinstate the road shoulder and strengthen the river bank. “We expect works to continue for the coming six weeks and hope to fully reopen the road by the end of April,” Mr Taylor said. 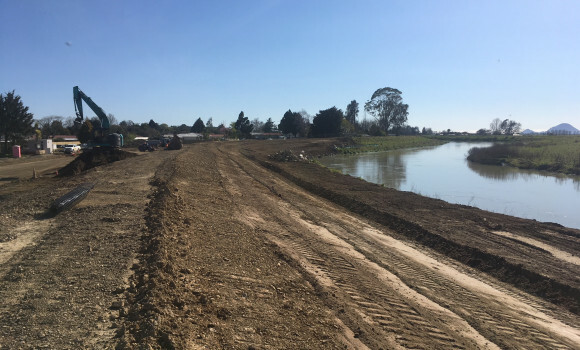 “Benching and stabilising the riverbank back up to road level will require a lot of rock material and we have been stockpiling that on-site for some weeks now, so our thanks go to local users who are being inconvenienced by additional truck movements. Please continue to take care around the work-site for the coming months,” Ms Chapman said. In 2017-2018 we completed repairs to 119 of the 520 sites along our rivers and drains that were damaged during the April 2017 flood events. In 2017-2018 we completed repairs to 119 of the 520 sites along our rivers and drains that were damaged during the April 2017 flood events. Over the next twelve months we will be working to complete repairs to a further 145 sites across the region. Much of the repair work involves rock, lots of rock. So over winter rock has been carted to stockpiles near the repair sites in preparation for settled weather, drier ground conditions, and the start of the construction season. To give you an idea of rock volumes - site RT116 on the Rangitāiki River will need about 4000 tonne of graded rock - that's 182 truck and trailer loads! And this is just one of many flood repair jobs of this scale. Check out the Flood Repair Project poster for more information about the project and what’s happening in 2018-2019. Removal of the temporary stopbank and reinstatement of the berm has been completed with river edge rock strengthening continuing until the middle of the month. Contractors have now moved their resources onto road construction and (weather permitting) the aim is to be installing the kerb and channel in the coming week. An alternative pedestrian detour is in place to keep people safe during the final phase of the road construction. Engineering Team Leader Peter Hay says contractors are now working on the removal of the existing temporary stopbank, and reinstatement of the berm, a process which will take a further two weeks of good weather. “When that final stage is complete, the town’s flood defence will be at the full design standard agreed in Council’s Rivers and Drainage Asset Management Plan. The relocation of services such as communications cabling and storm water systems and the construction of the new road have been happening in parallel with the stopbank work. Services are now complete and the foundation of the road is in place and our aim, again weather permitting, is to have the road completed in mid-September,” Mr Hay says. 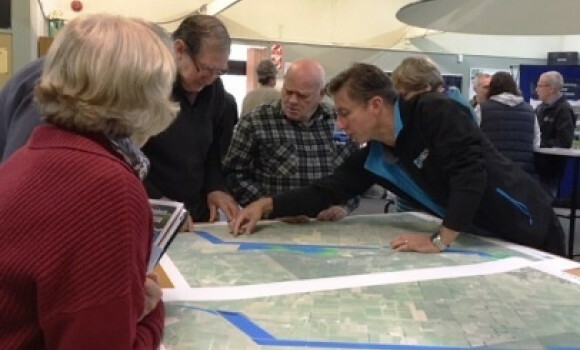 Thanks to everyone who came along to find out more about Council's various projects in the lower Rangitaiki on Saturday. Around 40 people attended and there was great discussion and positive feedback. Remember you can keep up-to-date with progress and activities by registering to follow the April 2017 Flood Repair Project.